My acne just won’t go away no matter what. My acne won’t clear up. My pimples won’t go. My acne won’t leave. Knowledge bomb: Your acne may not be ‘acne’ at all. It looks like acne. It feels like acne. 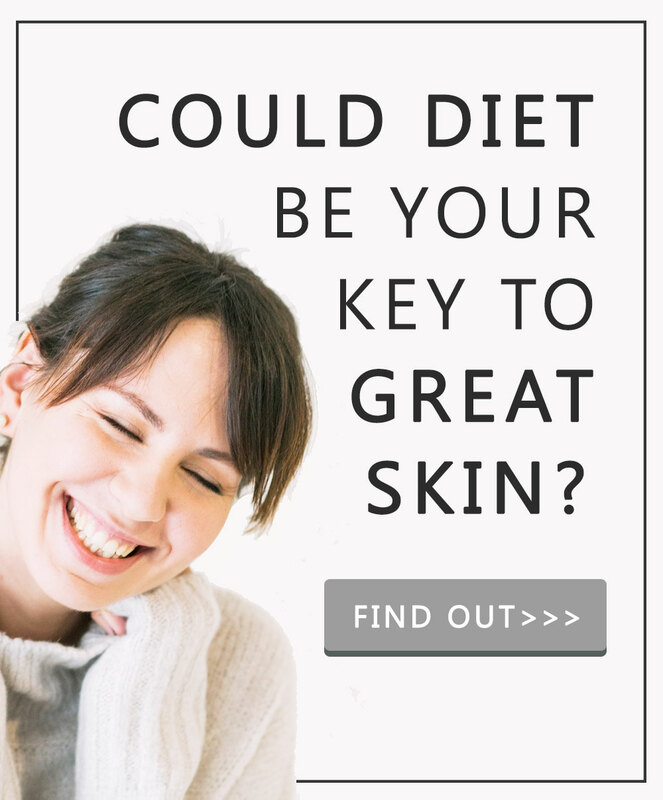 It has to be acne. 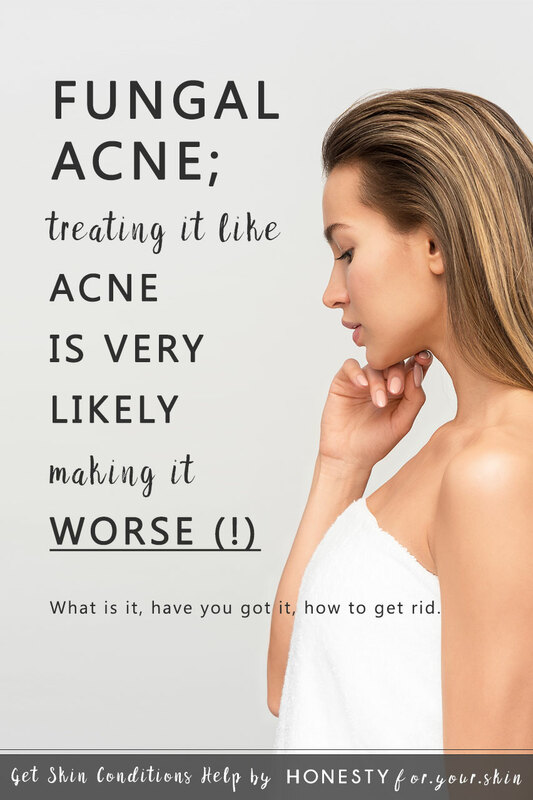 …and the kicker is if you’ve tried to treat fungal acne aka Pityrosporum Folliculitis as acne – you could actively be making it worse. Yes my friend – fungal acne. Do you have fungal acne? How do you treat fungal acne? The beginnings first. What the heck is fungal acne? Is it acne? Is it acne which won’t go away? Is it acne you’re going to have to live with forever – yikes – don’t even say it! The roots of your potential fungal acne are simple. Fungal acne (nickname) aka pityrosporum folliculitis (technical name) is not caused by what normal acne is caused by. Normal acne is caused by an overgrowth of bacteria. …aka an overgrowth of a bacteria known as p.acnes. Fungal acne is caused by an overgrowth of yeast. …aka an overgrowth of yeasts known as malassezia yeasts. Don’t worry – bacteria and yeast on your skin is a very normal thing. In fact it’s extremely normal. 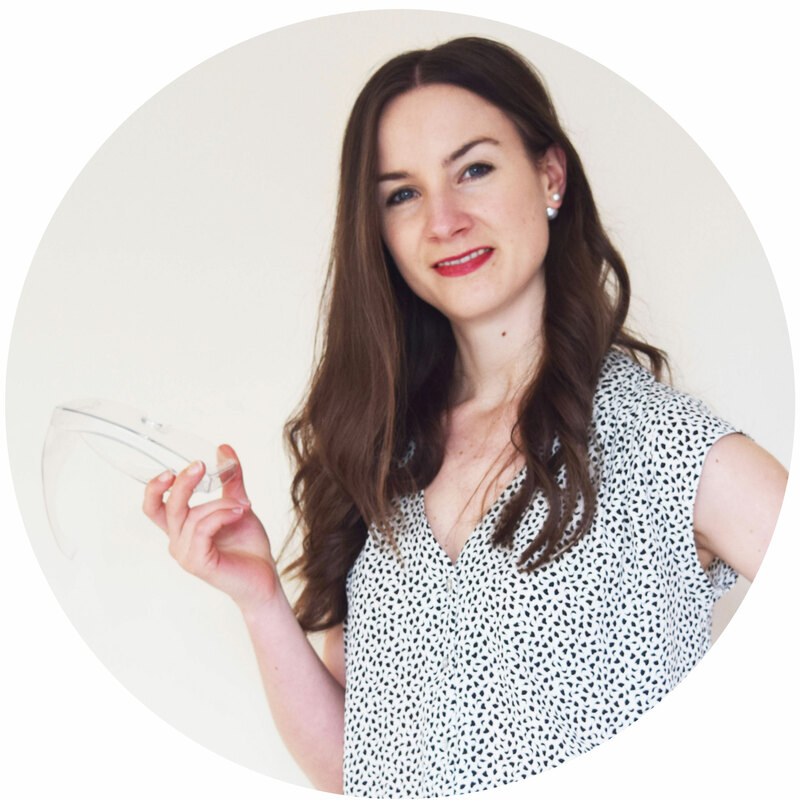 You need it… but the important bit – you need it in the right balance. You got it my friend – an overgrowth of yeast. An overgrowth of yeast is domino #2. So what about domino #1. What is the cause of the cause of your fungal acne. What’s the kick-starter? Who’s the door bell ringer? At fungal acne’s heart – it’s all about imbalance of your skin’s microflora aka what naturally lives on your skin. Antibiotics and stress are major. And usually both are causes you don’t realise. You might take antibiotics for a bladder infection – then later you get an issue with your skin. Bladder to skin. Weird link to make ‘eh. …and stress. That dear old friend. Stress is a creeper. You could be dealing fine with 80% stress. Then 80% stress becomes your new fine. You peddle along. Then boom – your body says please, please, pretty please take better care of yourself – like now. Are any of these 7 ringing alarm bells for you? There’s more my friend… check a handful more of these boxes below and it’s super likely your don’t have acne and super likely you do have fungal acne. The difference between fungal acne and acne is like the difference between a black skirt and a red skirt. Both technically look the same – but they also technically don’t (!) Both are skirts, but both make you look and feel different. Black’s for everyday. Red’s for date night. Try to treat your date night skirt like a work day skirt and your skirt’s going to turn heads my friend… and you’re probably going to be wondering what the heck’s going on, why is my red skirt not working like my black skirt? 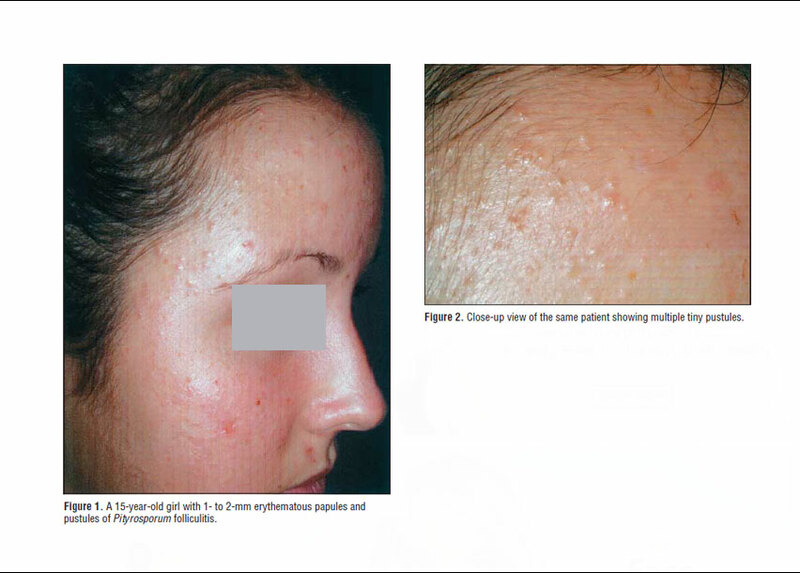 Source: Ayers K, Sweeney SM, Wiss K. Pityrosporum Folliculitis: Diagnosis and Management in 6 Female Adolescents With Acne Vulgaris. Arch Pediatr Adolesc Med. 2005;159(1):64–67. doi:10.1001/archpedi.159.1.64. The important bit! How do you treat fungal acne? How do you get rid of it? Pretty impressive picture up above ‘eh. Getting your skin right again is achievable once you know exactly what your skin’s going through. From here it’s simpler. You’re no longer stab in the dark. Like when you have a food craving but you’re not sure what for. You could eat everything in the fridge before finding a special sauce which works. Note: To know if you have fungal acne once and for all – go to your doctor. Tell them you think you might have fungal acne and want to know for sure. Here’s what they should do – carefully extract the contents of a spot aka the pus bit – send it to the lab for testing. Once at the lab, they’re going to smear your pus sample onto a glass slide with a 10% solution of potassium hydroxide. Then they’re going to look at your slide under a microscope. If you have fungal acne – they’ll see spores. It’s pretty quick. Double note: It’s very possible to have acne plus fungal acne. About 4.6% of people with acne also have fungal acne. How Do You Treat Fungal Acne Naturally? Aka at home and without having to get oral anti-fungal meds from your doctor. By the way it’s a sure sign fungal acne is what you have if any of these below ways work for you. It’s like playing poker – this is your tell. 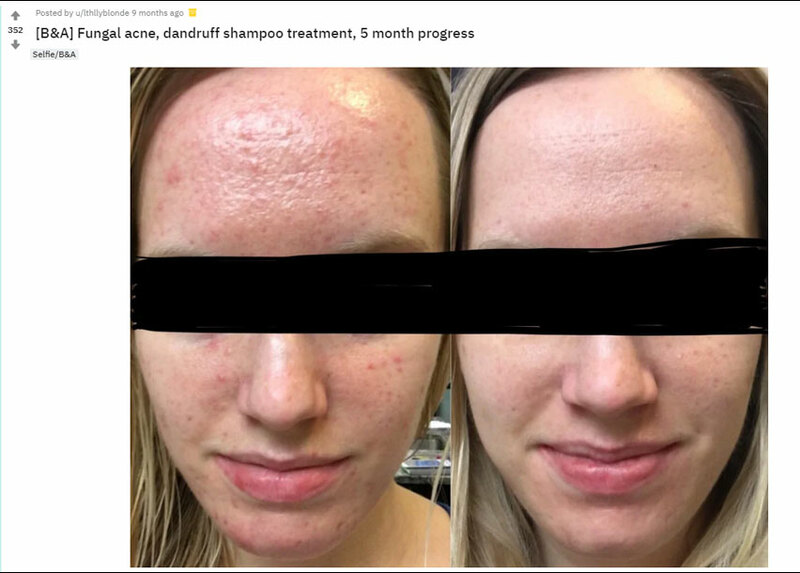 Published papers also tell us – the most common at home treatment for fungal acne is 2% ketoconazole shampoo used as a face wash for 4 to 5 minutes every other day. Now tell me in the chat below. Are you thinking your ‘acne’ could be fungal acne? Does yours look like in the pictures above? Oh and if you have more fungal acne questions – leave them too – I’ll be back to you very soon.